I am passionate about aquariums! I’ve kept fish for most periods in my life and am happy to pursue this hobby. It started with Goldfish in a 10 gallon aquarium as a child and progressed to the 125 gallon tank you see above. Thus far I’ve only done freshwater tanks. I really enjoy freshwater plants. Maybe, in a few years, I will branch out into saltwater tanks. I feel the same passion for aquariums as I do for databases. They are both their own contained world that I administer and develop. Why Am I Passionate About Aquariums? Why are any of us passionate about certain things and not others? I think some of it comes down to the way we are wired. For me I am wired to enjoy building, maintaining, and even cleaning my tanks. I find it rewarding to watch the plants and fish grow and flourish. I take satisfaction in knowing my efforts are directly leading to their success. It never bores me because it is living and always changing. Like most habits, aquariums are difficult to get started (or teardown) and easy to keep going. I feel the same passion for aquariums as I do for databases. They are both their own contained world that I administer and develop. There is a level of satisfaction from performing a job well done that you can see the impact. I have improved at building tanks during my hobby. I no longer have pictures of my first 10 gallon tank as a child but I have some decent pictures of more recent aquariums I’ve tended to. 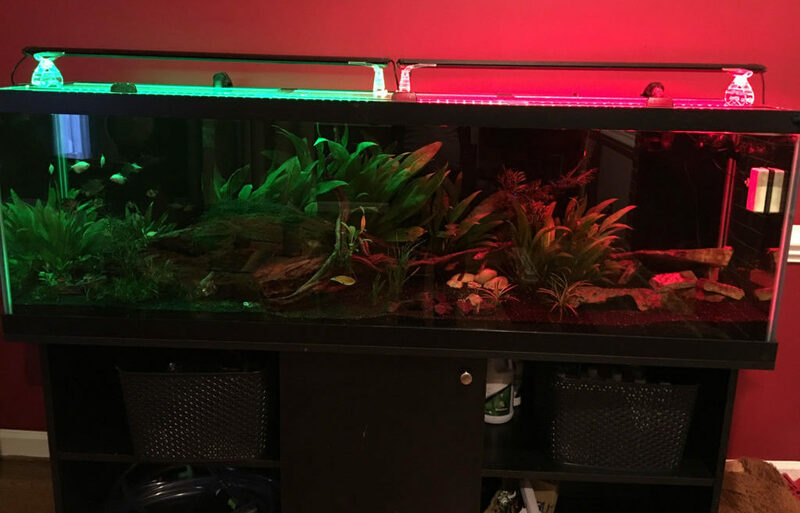 Here are some pictures that show the progression of some of my tanks. Side view – the angelfish don’t know what to make of this artificial environment. Angelfish are a favorite. Cichlid behavior is unique and fun to watch. I rebuilt the 75 gallon aquarium. Goodbye artificial background – hello new tiger barbs! Stepping up the plant game too – a better substrate along with a more powerful light for growth. Side view – the plants are getting thicker. Crinum calamistratum – a medusa like plant which looks cool. There is a faint current and the plant sways back and forth. Moved and rebuilt it again to a different room. Starting over can be fun but teardown and setting up is a lot of work. Moved apartments to set up again. Very good flourish of plants here. In 2012 I moved from Pittsburgh to Raleigh. It was too much to bring my aquariums so we had to sell them and move on. Fish gone – owner sad. That’s how I knew I really was passionate about aquariums. Last year I got back into tanks. I prepared a 125 gallon tank with freshwater plants and small peaceful fish. Spooky tank for Halloween! The LED lights for plants can change colors. Please take time to develop yourself and pursue hobbies. It will make you a better, well rounded, less stressed individual. Our technical jobs can be enhanced by sometimes looking away – just like when you realize the answer to a coding problem only when you look away or are in the shower. We are never done – there are just new beginnings. I leave you with these 2 videos of our Kribensis successfully having fry. If you liked looking at the fish photos then have a look at my Ethernet Home Wiring Project. There are tons of good photos of the work. Wow, nice work! I had turtles for a few years, and I struggled to keep those tanks clean, so I can only imagine how much work these are. They look great. Thanks Brent! I have become more efficient at it over the years. In the beginning it was tough but much easier now-a-days. Appreciate you stopping by!